One key feature most email clients have neglected to include is the ability to schedule emails for delivery at a later time. It's either hit the Send button now or come back later. However, there are several solutions out there. Some can only be used to schedule email reminders to yourself, but others are more versatile. Let's get started. First off, I don't use Outlook so I can't really recommend any plugins in particular, but this guide walks you through how to schedule emails. There are also many shareware plugins that make the task a little easier. 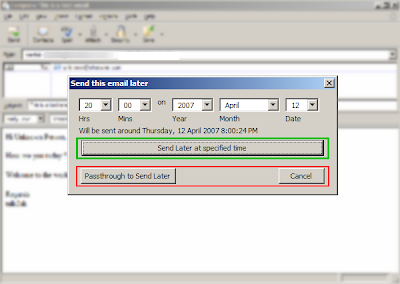 Send Later: This extension modifies the "Send Later" option in your file menu so you can specify a time and date for your email to be sent. Otherwise, your email will just sit in your Unsent email box forever. SendTools: This extension adds a "SendAt" checkbox to your compose window. Check the box to set up a time and date for delivery. Unfortunately, it doesn't work on Thunderbird 2.0b2. The only downside to these two tools is that Thunderbird has to be kept open for the email to be sent, which is not the case if you use a webmail solution. LetterMeLater: This is a very nicely designed site that lets you schedule both emails to yourself and others. Once you sign up, hit the Compose tab to begin scheduling emails for delivery any time in the future. There's also a recurring email option if you need to schedule regular reminder emails. FutureMe: We've covered this future email delivery service before. It adds in an element of PostSecret to email scheduling. You can schedule email for delivery to the future 90 days and beyond. This is not for short-term reminder emails. The social element to the site lets you make your emails open for public comsumption. FutureMail: FutureMail is a more flexible email scheduler than FutureMe, letting you schedule emails at any time from now to eternity. The nicely designed site lets you set your time zone so you can make sure your emails get delivered on schedule and also offers an RSS feed of your future emails (if you choose to make them accessible). Thanks for the great tips. I tried all these services, and found that LetterMeLater.com is by far the best. It is very flexible, and even has a feature that integrates with any email service. Futureme is hard to use because you must schedule at least 90 days in advance, and futuremail does text emails only, with ads at the bottom. I agree with Freddy. Plus, you can choose to be reminded 3 days before the email is sent, in case you change your mind. And, no footer! There's no indication that you didn't send it directly from your email. Hello. Letterme is not leting me send more than 3 emailing address at one time. When I created the group it dosnet let me becuase the group has about 20 emails.